?Let me ask you about your university. Is it a private or public university? Dr.Michael Pfeffer: It is a public university.
? I understand that public universities have introduced a scheme for free tuition fees in 2014. Is it correct? Dr.Michael: Germany is a Federal Republic; there are federal States, and universities belong to the Federal States. In our case, the federal State is Baden Wurttemberg. This State is an exception to the rule. They have reintroduced tuition fees for non-European Union students. This is only for this federal State, which is on the south west of Germany; not for the other ones.
? Why has that State done so? Dr.Michael: The State president realised that some universities, especially those providing education in music, are dominated by foreigners - typically from Korea, Japan and Far East countries. The free tuition fee scheme costs the tax-payer 100,000 euros per student a year. He thought it was crazy and decided to reintroduce tuition fee, only for non-EU students. This, to our understanding, is a problem; it was a political decision. Politics, as you know, is sometimes guided by emotion and not based on logic or the real situation.
? Do you feel that it is not in the best interests of the students? Dr.Michael: Not in the interest of ours, or our country even, because we need international education. Germany is mainly an exporting country, which should be able to interact with other countries; education is one of the things that earn high returns, not in a monetary market, but in a market of intellect or brain. It is something totally different. The future is in internationalisation of students. ?. How many universities will come under this particular exemption? Dr.Thomas: Around 40 universities; roughly 10 per cent of the total number of universities in Germany. There are more than 400 universities in the country. Our State has roughly 10 per cent of the country’s population.
? That means there is much scope for foreign students to study in Germany if you take the country as a whole. That makes good news for foreign students. There is a difference only in the State where the exemption exists. Isn’t it? Dr.Michael: Yes; but the idea behind the exemption is that ‘we are that good; we can easily afford to do so’; to some extent, it is not wrong because the tuition fee is rather low; only around 3000 euros a year. It is not much,in comparison to UK, Australia or even India. Dr.Thomas: If you want to study in Munich, Cologne or Berlin, the cost of living is high; rented houses are much more expensive. Munich is one of the most expensive places in Germany. Wurttemberg is much cheaper.
? I believe there is some language barrier for undergraduate students. They have to learn German. Is it a handicap for students from foreign countries? Dr.Thomas: Again, ‘Yes’ and ‘No’. Dr.Michael: Let me explain it. Yes, of course, because in most of the universities all over Germany, the medium is German. However, there are some universities, (and ours is one of them), which focuses on students internationally. We teach students - especially Indian students - in English, at the undergraduate level. However, that is only for the first two years - the first four semesters. Then, in parallel, they have to learn German. So, if you start first semester, you start with zero knowledge of German; then a semester afterwards, learn German at the A1 level; after the second semester, there is A2; then B1 and B2. That means after two years, you have to achieve the level of B2. And, B2 is the entrance language level which is required to enter our university. In our campus, there are many foreign students, particularly from India; our theory is that India is our strategic partner. And then, the next half of the undergraduate studies, there is an internship which has to be done in a company in Germany. This is part of our education. And to work in a German company, you need a certain knowledge of German; at least when you go, let us say, to the canteen, because the people at the canteen will not talk your language. Of course, in your department, wherever you work as an engineer, people might understand English. But if you want to break ice at a meeting, or you have to discuss matters with the people, you need to know German. We have excellent examples at work, especially with Indian students.
? Do you mean to say that language is not a barrier for the discerning student? Dr.Michael: Not in our campus. As I said, in our campus, we have special programmes in physical engineering, computer engineering and a few other branches where we focus on students from abroad, especially from India. Always, we have about 10 per cent of our students coming from India. We have a council of Indian students where they organise themselves on the campus.
? You were talking of expenses; how do you compare it with studies in UK or US. Many of the Indian students prefer to study in UK, USA and other countries rather than Germany. Why is it so? Dr.Michael: As I said, the tuition fee is 3000 euros a year. If compared to UK, I would say, it is 25 per cent of that of UK; The fees in UK, typically is 9000 pounds - corresponding to 12,000 euros - if my calculation is not wrong. In terms of living expenses, London is extremely expensive. In general, I will say that in Germany, you pay considerably less amount than what you have to pay in UK or USA.
? You are saying that education in Germany is cheaper than UK or USA. Then why is it that more students go to UK and USA? Dr.Michael: After Brexit, you don’t know what will happen. It may become costlier in UK - if UK goes ahead with the currently conceived, hard Brexit; everything will be related to life expenses. Life becomes more expensive, because they have to import a lot of things – including agricultural products - from other countries. They have to import from EU or other countries; they have to pay import tax.
? 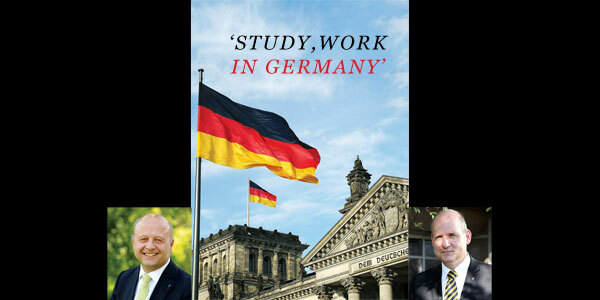 Against such a background, Germany should have been the ideal destination, the preferred location, for Indian students. Why is it not happening? Dr.Thomas: It is the language. Dr.Michael: Apart from language, there is another factor - that of parents; the parents would go for what they think is best for their children. Dr.Thomas: UK and US are associated with doing business; getting money. Germany is into engineering. Dr.Michael: Those Indian parents who have money, prefer to send their children to UK or US, because they themselves might have studied there; they relate business with money. Engineering is something related to technology, related to Germany. Those who are engaged in the engineering career are not at the highest level in society. They are part of the upcoming middle class; these guys are not hungry for doing business. The higher economic classes in India look towards UK; probably Cambridge. And, in UK, not everything is golden.
? Is it difficult to get into German universities as far as Indian students are concerned? Dr.Michael: It depends, of course; there are entrance qualifications; and, I would say, the hardest struggle here is the language. Dr.Thomas: If you are able to study in German language, it will be easier; not only in Baden-Wurttemberg. we have a lot of possibilities in engineering education; but if you want to learn in English, it makes difficult. A certain percentage of openings are available for students to learn in English; for example, in Mechatronics, we have 30 openings and we get about 500 applications.
? Have you got courses in Artificial Intelligence? Dr.Thomas: Yes; AI is related to computer sciences.
? Where is Germany placed in study of AI? Dr.Michael: Germany is among the leading countries. There are several other countries such as the UK, USA and probably Japan; but, certainly Germany is among the top five.
? How is Germany doing in the field of solar energy? I understand Germany has progressed much in the field. Is it so? Dr.Michael: There is strong interest in pushing this technology, but Germany is certainly not a country with much of sunshine, compared to India. That is why there is a certain limit. In terms of technology, there is a lot of effort. However, we made a big mistake. There was a decision to export the technology on solar energy. We had a lot of industries in the field; the industry survived only by government support. And, then, these patents and technologies were officially transferred to China. It resulted in China producing the highest number of panels, using German technology. ?A large number of solar panels used in India come from China. How about Germany? Dr.Michael: In Germany too, it is the same. The policy on solar panels looks crazy. It appeared okay in the ecological point of view, but in terms of economic business, it was a mess. It is a typical case. If you push a certain technology too much through the official policy, you tend to destroy own market by giving the market to another player. ?Certain media reports have suggested that In Germany, the academic hierarchy is much stronger than in UK. Is it a reason to dissuade students from pursuing studies un Germany? Dr.Michael: Germany is not at all hierarchic. What they mean is something else. If you have to become a professor, you have to undergo a certain process and this is what they mean by it. If you want to become a professor, it takes a while. It is nothing to do with students and professors. It pertains to the relations among the academic staff.
? How about getting work after graduation? What is the situation? Dr.Michael: Currently, the situation is excellent. Employment seekers can easily find a job because unemployment rate in our region is around 2 per cent. It is the lowest in Germany. if you have certain knowledge in German, the chances are excellent. If you speak only English, then it could be different. If you have undergone two years of German-English language system, and have done internship in a company, it is rather easy to find a job. It is also facilitated by the distribution of labour between the rural and urban areas. In urban agglomerations, there could be unemployment, but I would say that in rural areas, it is different. That is why the goal of our university is to keep the international students in the rural area, and to share them the advantage. If you go to an urban agglomeration, everything is more expensive and it is more difficult to get a job.
? How is the performance of Indian students? What is your perception about the Indian students there? Dr.Michael: This is very difficult to answer. I will say something about all students coming from Asia. Typically, students from Asia have a different attitude towards action. They have been trained to wait all their life until someone tells them that ‘ you take this; or do that’.
? Do you mean to say that they lack initiative? Dr.Michael: Yes. The students from countries such as Malaysia, Australia and India have a tendency to be indecisive, waiting for instructions from superiors. This trait has been noticed among Indian students in the beginning. This is because they had been told all their life by the parents to do whatever they wanted. Dr.Thomas: This is the picture we have, though it has been observed that after two years of training in Germany, they change their mindset and react independently. There is the Lewis Model to describe how people react in different countries. Different countries are marked differently in the chart based on the respective response of the people from those nationalities. Based on this analysis, we can say, India is not good in engineering. A German could be a bad businessman, but he can build good cars; engineering is in German DNA. If you want success in future global market, in a world which is getting closer and smaller, we have to deal with different people from across the world. This is a guideline for our internationalisation. (Inputs from Dr.Varghese Panthalookaran acknowledged). The writer is Editor of Pallikkutam. He can be reached at editor@rajagirimedia.com.